A couple of months ago I had dinner at Sacatomato Ann's house. We had a look at her backyard garden and there were two things I took away from that day. First was their great raised garden made from the concrete they had torn up from their backyard. 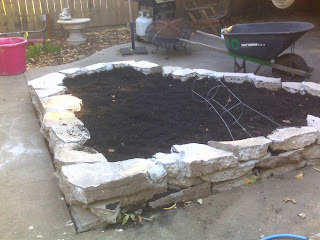 I had been wanting to do a raised garden for some time but didn't have the extra money for all the keystones or bricks I would have needed. I loved the idea of free broken concrete. Later that week I just happened to see some men tearing up concrete. They agreed to deliver it to my house. So this is the raised garden I built. The second thing I learned that day was about amaranth. They had quite a few amaranth bushes growing with the lovely purple flowers. Turns out that it is quite an interesting plant. Turns out amaranth is a plant that many are trying to see cultivated in third world countries that have poor growing conditions. You can not only eat the seeds, but also the leaves and flowers. I've been trying to get into new grains. I love quinoa and use it in place of rice whenever I cook at home. It's a healthy whole grain that is high in protein. It cooks the same as rice. So whenever I make anything that would normally have rice as a side, I use the quinoa instead. I wanted to check out the amaranth and found it in the bulk bins at the Co-op. I took only 1/2 a cup home and cooked it the same way. Then I ate it as a porridge with a little soy milk, cinnamon, and stevia. Delicious. I've found another new grain to play with.